I wanted to do a FOTD using products from only one brand, as much as possible, inspired by Emily's "one brand tutorial" (Beauty Broadcast on youtube). Ambitious, but not as resourceful as I thought, I do not have enough Burberry products to finish one full face. In this look, I used Burberry liquid foundation, compact foundation, primer, eyeshadow, and lipstick. The samples of make up base and foundation were obtained with purchase from local burberry counters. Everything else I purchased with my own dollars. Various products from other brands were incorporated to finish this face. None the less, it is primarily a Burberry FOTD. I am planning to buy a few of their Complete Eye Palettes tomorrow/today (Friday!) with my aunt. Before those delightful additions to my collection, you can see my entire current Burberry make up stash in this link! By the way, if you're interested in the Moustache ring, you can actually go to this etsy store (link) my friend and I opened. There are only a few pieces left! The lighting that day was not too forgiving, it was cloudy and gloomy. Hence, photos' colour was a bit washed out and looked cool. Hope you won't mind, and please enjoy! top left, with base and foundation on. 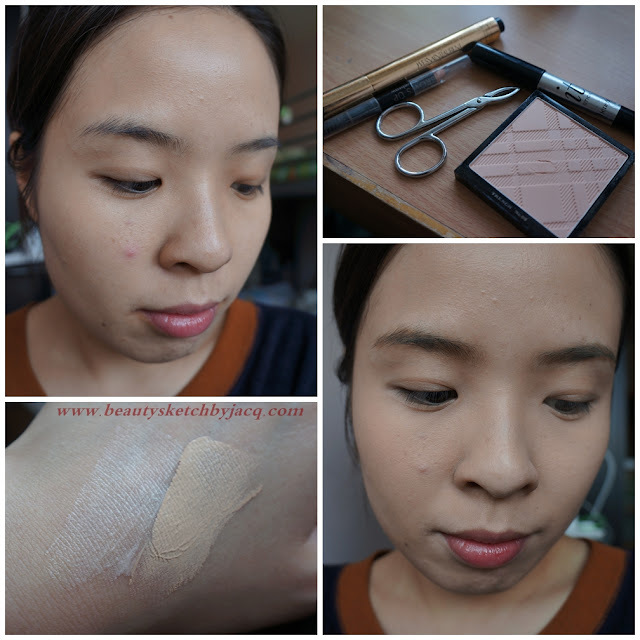 bottom left, Fresh Glow and Foundation No.4. bottom right, with brows, concealer and powder foundation. 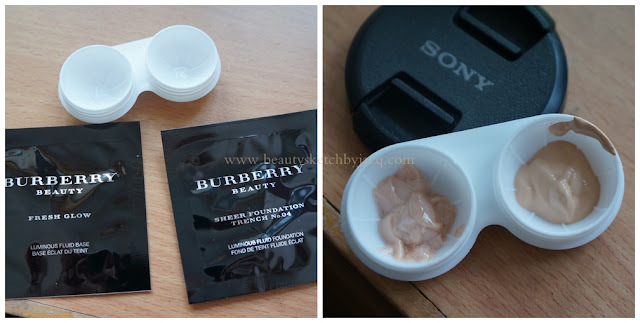 Burberry, Fresh Glow Luminous Fluid Base is an illuminating type of foundation base. It gives skin a very pretty glow. There is a hint of pink in it, but for the most part, it is rather neutral and subtle. I used it all over my face focusing on the under-eye, cheekbones, nose tip and forehead. I like it mixed with my foundations to create all-over luminanace, because on itself, it is really really sheer and hardly noticeable. Burberry, Sheer Foundation Luminous Fluid Foundation in Trench No.04 is a pretty good match for my skin tone. It doesn't give much coverage, probably sheer to medium. I find it gives my skin a 'skin-finish', which is good. As the finish is rather glowing, and I was having a rather bad skin day, I had to do more. On the under-eye, I conceal and brighten with the YSL Touche Eclat #2, and on the big spot on my cheek, I used the Benefit It Stick. Finally I set everything with the Burberry Sheer Foundation Luminous Compact Foundation in Trench No.02. This is a tester which I got from a fellow blogger ('s blogsale), the shade is about right in terms of depth, but way too pink for me, but I still like to use it to brighten up my face. The finish is really beautiful, not too matte but definitely has coverage and take away excess shine. Great for my dry skin. I didn't wear blusher as I feel like any colour will compete with my lipstick, so I later dusted on some NYX Blush in Taupe. I prepped my eyes with my favourite eye primer of the moment, Canmake Eyeshadow Base, and then packed a load of Burberry Eye Enhancer Sheer Eye in No.22 Pale Barley on my lids. The colour is subtle, sophisticated and elegant. I also blended some of that on my lower lid. Then I lined my water-line with Majolica Majorca Cream Pencil Liner BK999. Liner was smudged out with Burberry No.24 Mulberry. I also smudged some Mulberry on the upper lash line. I used Rimmel ScandalEyes Mascara to hold my curl before applying false lashes. It was okay, the wand/brush is enormous, but apply ridiculously little product on. Didn't do anything for my lashes. After applying Daiso #515 lashes with Luminous Change Eyelash Glue, I applied an extra coat of Rock and Republic Extremist Masacra (discontinued). En Coleur on the left, Burberry Pink Azalea on the right. I applied one of my many current favourite bright/dark lipsticks, Burberry Lip Velvet No.308 Pink Azalea with a lip brush, and perfected the edges with En Coleur Lip Pencil in P17 Rosewood. That's it! Thank you for reading/scrolling down till the end! I have been wearing bright lip colours a lot these recent weeks and I am in so much love with reds and berries and such. What is your current favourite lip colour!? I kind of agree, Mulberry is pretty brown and not that berry-ish really. By the way, I love your blog - esp the pictures! Thank you for having a look :) Pictures are the way they are thanks to Australian sunlight. You look gorgeous!! I love the tutorial. Your blog is pretty amazing too, reading it now! thank you thank you little happy heaven! Your false lash skill is INCREDIBLE! Beautiful FOTD and my, that is one captivating red!!! Thank you Tina :) I do love this pinkish red a lot!